In the second part of this series, we focus on giving independent artists an insiders' guide on how to succeed within Superfine! and other fair environments. For the purposes of this discussion, we're defining "independent" as currently representing oneself. 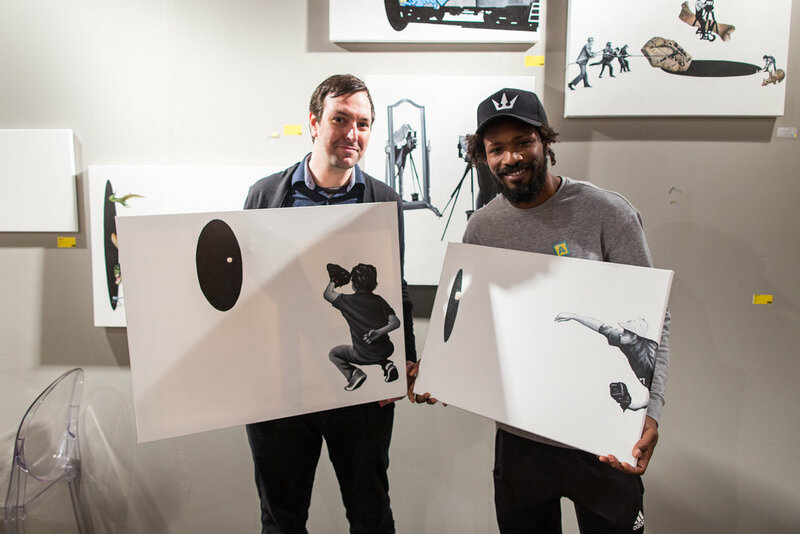 We believe galleries do play a valuable role in the promotion of an artist's work, but we also see tremendous value for an artist in being one's own champion at fairs like Superfine! that feature an artist platform. Gleaned from collective years of knowledge our team (we're all artists AND collectors!) have gained over multiple fairs, we hope these tips help you prosper and connect with collectors at Superfine! and beyond. Once interested parties take the plunge, that's the start of a relationship, not the end. You want the people who invest in your work to be invested in you and your career. A satisfied buyer always makes the best evangelist, and they'll not only consider future works but will sing your praises to friends and family. Don't run the credit card and send them on their way, make sure to collect their information and stay in touch. A handy tracker of which works sold to whom and for how much will help guide you when you're deciding which new series to show them, or who to send a holiday card/invite to your next show to! This is a big mistake often made by all levels of exhibitors at fairs. Without being overly pushy, and while effectively "reading the room" to ensure that they're actually excited by your work, attempt to collect every single person who looks at your work's email address. Skip phone numbers - calling people is seen as intrusive these days, but it's expected that you'll follow up by email. Remember, people who come to a fair are interested in art in a commercial setting - they've bought art before and will do it again. By collecting their email, versus just giving them yours, you can follow up with them about the piece they loved and any other work you want to show them. If they aren't interested, they'll tell you, but there's a strong chance they are. It's not a bad idea to have printed materials to give to visitors. However, from a collector's perspective, I suggest against postcard-sized materials unless they are unequivocally, mind-blowingly, amazing. Walking around a fair, a potential collector will encounter dozens and maybe hundreds of people hoping to sell you art. That means pockets get full and things get crumpled, and later thrown away. A very high-quality business card that cuts to the gist of things is often a much better giveaway than a flyer or postcard, which can become merely an annoyance. That said, if you can create a giveaway that people actually want to keep, you might be the exception. Think about it: would I actually keep this on my desk? If not, stick to business cards. Not everything has to be given away for people to remember you. In fact, making a sale...any sale...changes the dynamic by turning you into an artist whose work they own, and them into a collector of yours (even on a small scale). To that end, I highly recommend having books and prints available for sale. You aren't their favorite artist yet, but you might be every time they and their family/friends open your excellent, beautiful, stunning book. Small, affordable prints serve the same purpose. Selling art can be a long game, and finding people that support your work enough to own versions of it can result in big long-term gains when you connect with those collectors again in the future. 5) BE PRESENT / SELL YOU! One of the biggest mistakes we've seen is when exhibitors spend the money and time to be a part of an art fair, then get swept in the fervor of what is surely a fun art week, resulting in unattended booths. People are there to speak to you and learn about you, your work, and your process. If you aren't there, you can't tell them and they won't buy. With an emerging art fair, rarely does a collector fight tooth and nail to procure a work from an artist or exhibitor who isn't there to talk about it. They simply move on. To avoid this, stay rested, keep your enthusiasm high, and be there during all fair hours. Yes, they're long hours, but in the long run it's only 4-5 days which you're paying for - make the best of them! Forging long term connections with everyone in the fair setting is ultimately the greatest value you'll gain from the experience. There will be fairs where your entire presentation is swept up on opening night and you'll be toasting champagne the rest of the fair. Other times, you'll wait till the very end and a last-minute buyer will appear. Still other times, it might be a slow pick. Regardless, make the absolute most out of your participation by connecting with your peers, arts professionals, collectors (even if they don't buy your work) and the myriad of interesting people that attend art fairs. The long-term rewards far exceed the short term relief at making back your costs in the fair itself. When deciding what to show, take your time and perhaps have friends/collectors from different backgrounds weigh in on what they feel most strongly about seeing in your exhibition. Of course, it's ultimately your decision, but you want to curate your work down to the strongest possible pieces. Beyond the shipping expense savings, having a strong, concise presentation versus one that displays "something for everyone" can often be the ticket to catching a collector's eye in a crowded fair environment. 9) ...BUT DO HAVE A LOWER PRICED OPTION SO YOU DON'T LOSE A SALE. With the above in mind, it's still important to have a few very accessibly-priced (under $500) works on your wall. We also allow and encourage a simple print rack adjacent to your placement where you can feature prints or small works. Smaller works do sell, especially when collectors aren't ready to commit to your pricier pieces, so it's good to have an option that collectors new to you can latch on to. Always keep your audience in mind for what you decide to exhibit in a setting like an art fair. For example, your favorite piece of art that you've made may not necessarily be something that a first-time collector would buy as they are becoming acquainted to the art world. Context is everything when viewing and selling art and can make or break a successful exhibition experience if not understood properly. Seeing the benefits of participating in an art fair extends far after the fair is over. Make sure to always be at your booth, ready and willing to engage and talk with people. This also means having business cards to give out and a notepad (or iPad!) to take down names and emails of attendees who like your work and remembering to follow up with them. Just because someone didn't necessarily buy your work at the fair doesn't mean they won't in the future. Always be prepared and follow up! "INVEST IN A PROFESSIONAL PRESENTATION!" While there's no doubt you have a beautiful eye when it comes to the art you make, does your framing/printing/finishing do it justice? Choosing to spend a little more for quality, professional printing and framing has been what has allowed me to sell the same photos for $1,200 instead of $50. Custom framers typically offer significant artist discounts so you don't have to resort to cheap IKEA frames. It may seem like a frustrating cost to add to an exhibition, but it'll make you more confident about exposing your art to the world and make that collector more comfortable hanging it in their home. Put your new art-selling knowledge to the test.